Arrow A is the beginning of the growth increment. 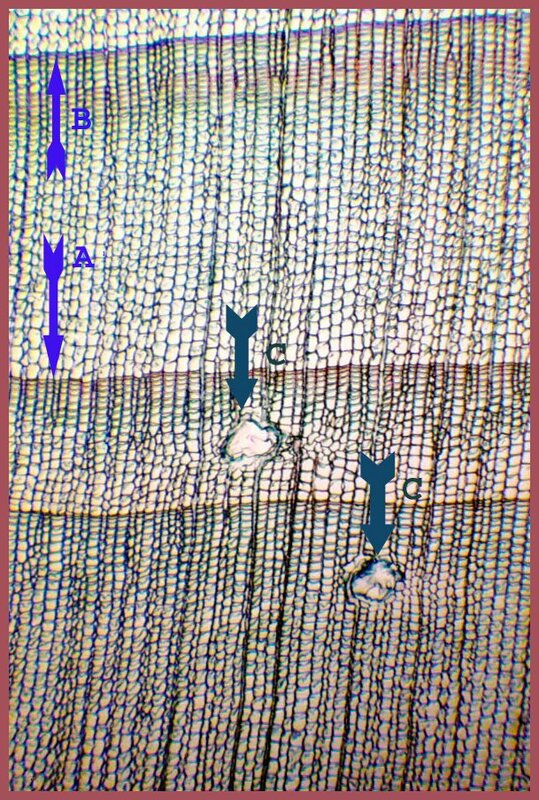 Notice the tracheids are thin walled at arrow A while the end of the growth increment, arrow B, the tracheids have become thick walled. So, their loading capacity is similar to that of ring porous, loading large amounts of liquids in the earlywood while only moderate amounts in the late wood. Arrow C's show two resign ducts. Resign ducts are enlarged parenchyma cells which produce resigns. This tree is a conifer, with tracheids and a conifer with resign ducts in the wood.